How Far is MCB Aassetz Quarter Acre? MCB Assetz proudly announces new venture “MCB Quarter Acre” a farmland concept near Chennai limits with beautifully plotted gated enclave, this farmland project which is going to be an extra special bonanza for nature lover. When it comes to investing in a farmland “MCB Quarter Acre” gives you entirely different experience than buying your primary residence / land. “Quarter Acre” busts the myth that owning a farm expensive.We provide state -of-the-art facilities that aren’t too heavy on your pocket, its gives immense satisfaction to grow your own garden/farm and reap the crop like kitchen vegetables and fruits which will also generate a regular income. Return on Investment MCB Quarter Acre presents various opportunities to get monitory returns along with pleasure. Activities like Organic farming, Breeding (Birds and Pet Animals) and renting Cottage not only brings you closer to nature but also help you attain returns on investment by profiting by such activities. By renting your cottage you can be rest assured of returns. We will ensure proper maintenance while you enjoy the benefits mile away. Form the point of view of Investment, this farmland promises exponential growth and appreciation. Imagine spending the weekends in your own beautiful Farmland near Chennai limits. Breathe fresh air and surround yourself with full of greenery wonders which define the best in natures mother lap. Escape the bustling traffic and pollution of the city. Exploit the farmer in you. Show your favorite sapling, water it, manure it, pluck the fruits & flowers and give it your near and dear ones. Totally 42 Farm Plots with each plot demarked with wooden fencing and gate. Tar roads lead the way to the “MCB QUARTER ACRE”. Sweet ground water available at the depth of 50 feet. 3 yrs maintenance free, after 3rd year a nominal maintenance charges will be collected (One time Charges). 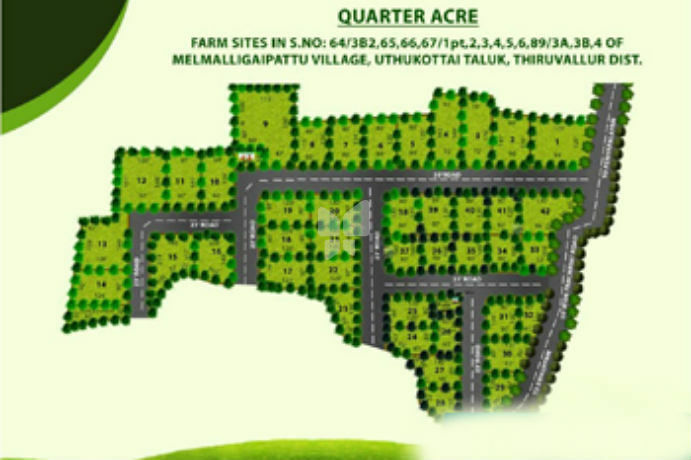 MCB QUARTER ACRE” at Redhills near Periyapalayam. 38 Kilometer and just a drive of 40 Minutes from Chennai. WE MAKE REAL ESTATE INVESTMENTS EASY, EFFECTIVE & EFFICIENT FOR YOU! The builder has a good track record in the realty development field. The builder has been fulfilling its customers dreams, by developing perfect homes. The builder has been developing project around Bangalore and its suburbs and one of the highly welcomed projects of the builder is The MCB Nityotsava a plotted development which has created a good vibe around the area. The builder is also active in Chennai and been developing some good fortune breakers in the area, MCB Aassetz The Retreat located in Sriperumbudur, Chennai which is also a DTCP approved project in the area. A plotted development of various dimensions in the area. The builder is also an active realty developer in Trichy The MCB Samaya located in Samayapuram, Trichy. Builder is an active plot developer, who has been developing plots in major residential localities around many areas. We provide impeccable service to real estate clients and Investors, maintaining and enhancing the asset value for investors while providing world class facilities. Honoring time-bound obligations has been our strength right from the beginning and this legacy will continue. MCB Aassetz has the skill and knowledge to evaluate a property and create the optimum strategy to achieve highest customer satisfaction. We strongly believe that our success lies in our customers short and long-term success; we reflect this in every transaction that we do – small or big. Our commitment to our clients has helped us build strong bonds.